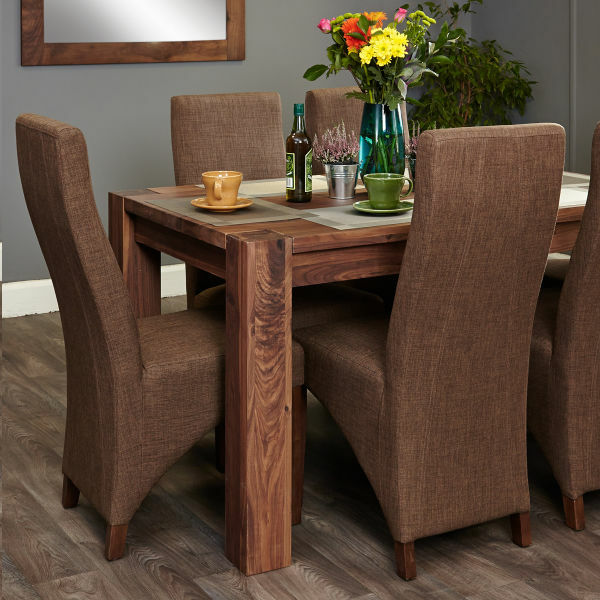 Thinking about a new dining table set? 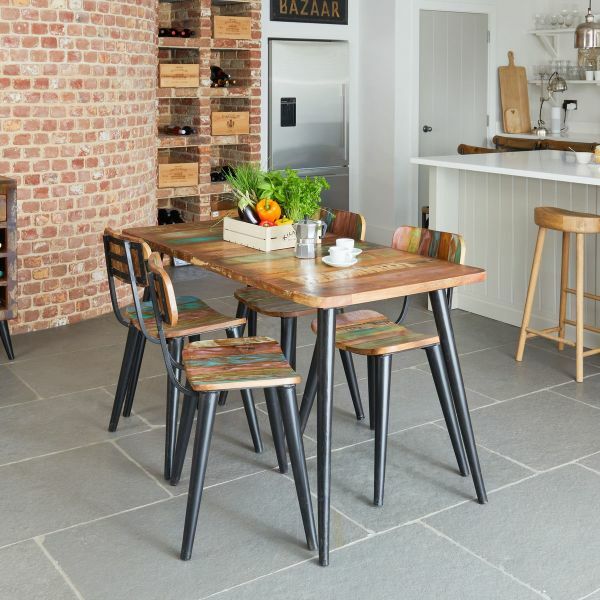 Whether you’re looking to buy your first table or you want to upgrade, the market can be overwhelming. 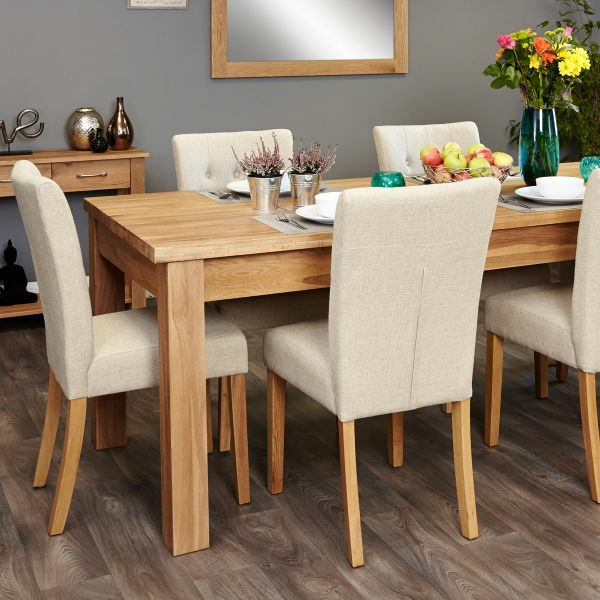 That’s why here at The Wooden Furniture Store we’ve done all the hard work for you when it comes to choosing a dining table and matching chairs. 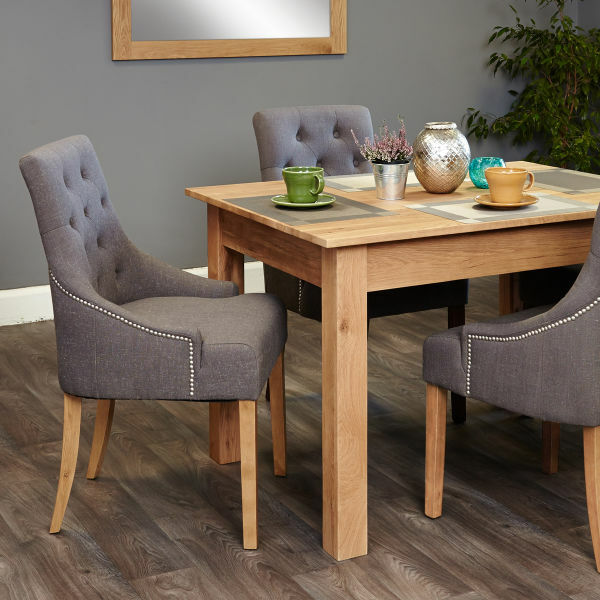 We’ve created dining sets in a selection of our table sizes that each come with a choice of different but perfectly coordinated upholstered chairs. 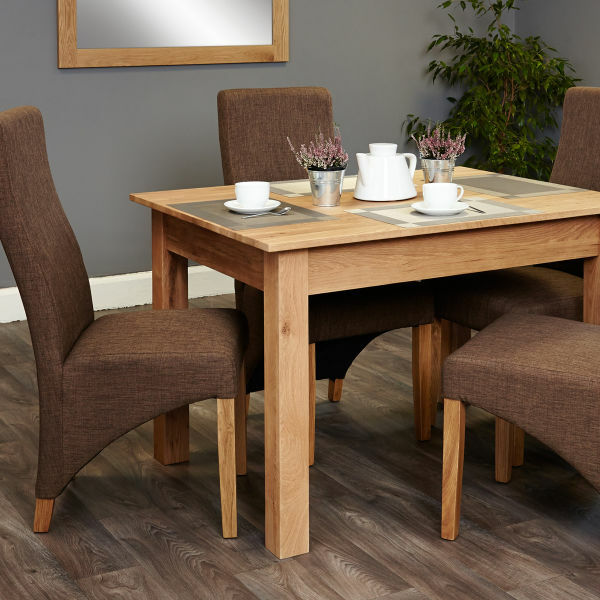 Our chairs are designed to be comfortable and the correct height and width when seated at each of the different tables sizes. 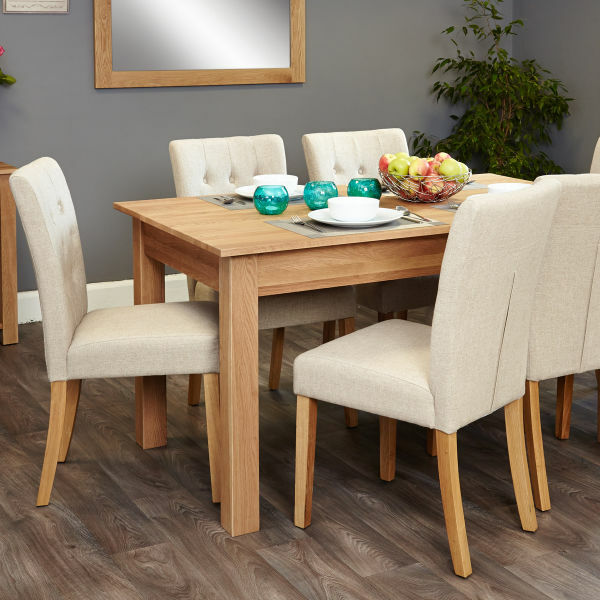 We understand that gathering around the table with family and friends is as much about the occasion as it is about the food and having a beautiful dining room table and matching chairs can make all the difference. 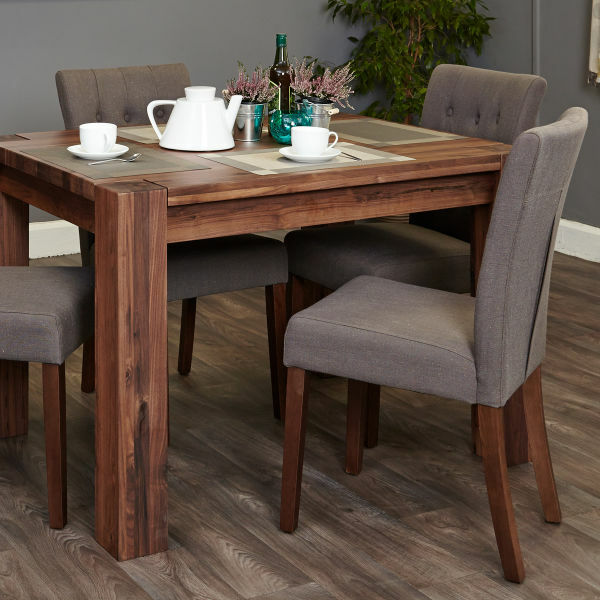 We’re here to help you choose one of our dining table and chair sets that’s stylish, solidly constructed, one that works with your budget and is just right for you and your family. Here are some factors you could consider before you buy. 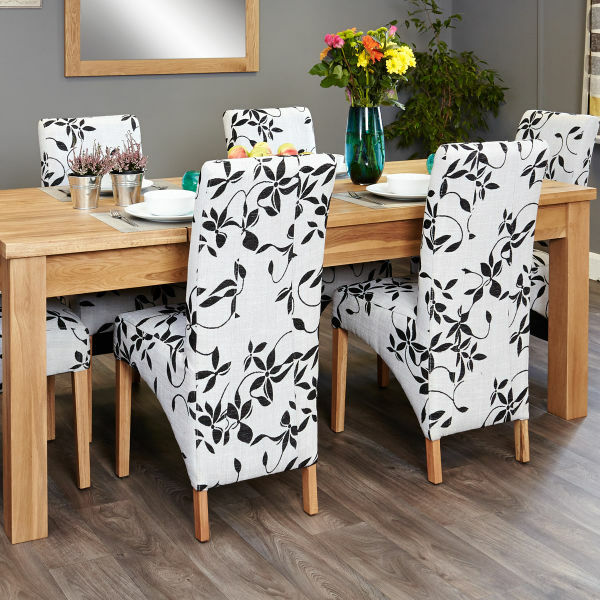 Which size dining table set will work best for you? 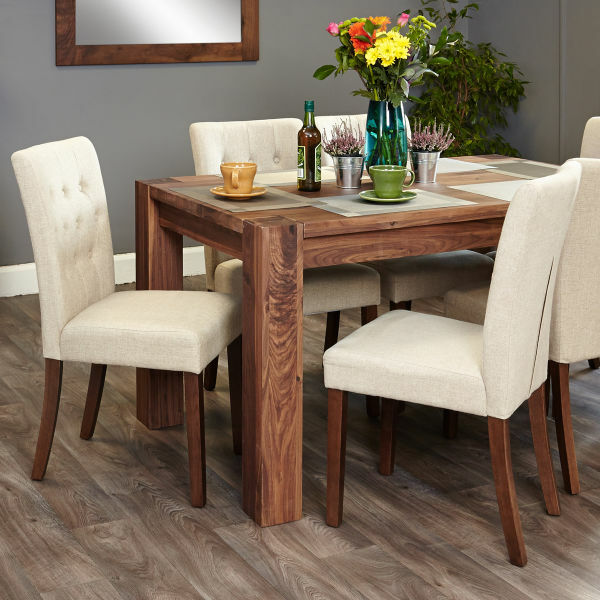 Finding the right size table for your room can be a challenge, too small and it can feel marooned, too large and it will feel cramped. The larger the room, the longer the table you should have–and vice versa. As a general rule, try to leave around 100cm distance between the table and walls so there is enough of a gap to comfortably walk around. 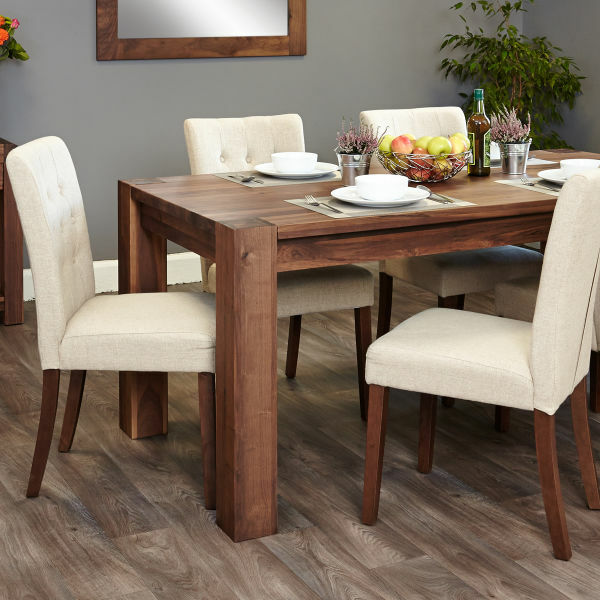 When you’re choosing a dining table set, your next decision is the shape - round, square or rectangular The answer generally depends on space and how many people you want to seat. For extra-small or corner spaces, consider a round table which is easier to navigate around and takes up less space than one with corners. 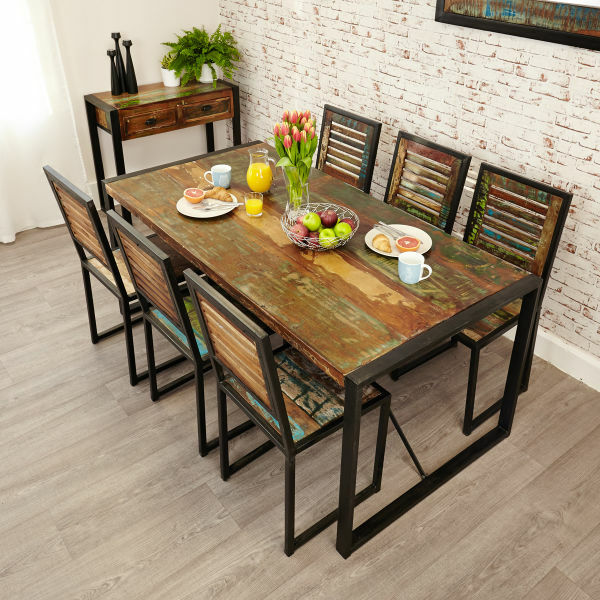 Why not consider our best selling Urban Chic round table dining set which is made from reclaimed wood from Southern India and is a great option if you want to add some unique style to your dining space? 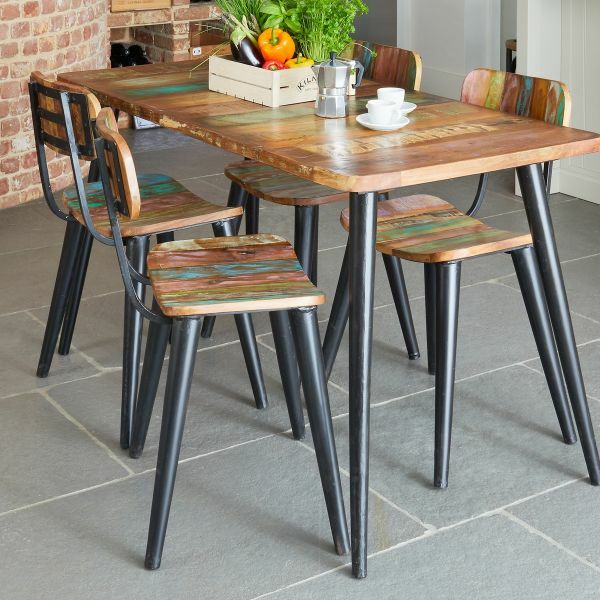 Made from recycled 100 year old wood, the set not only looks great but is a sustainable choice too. 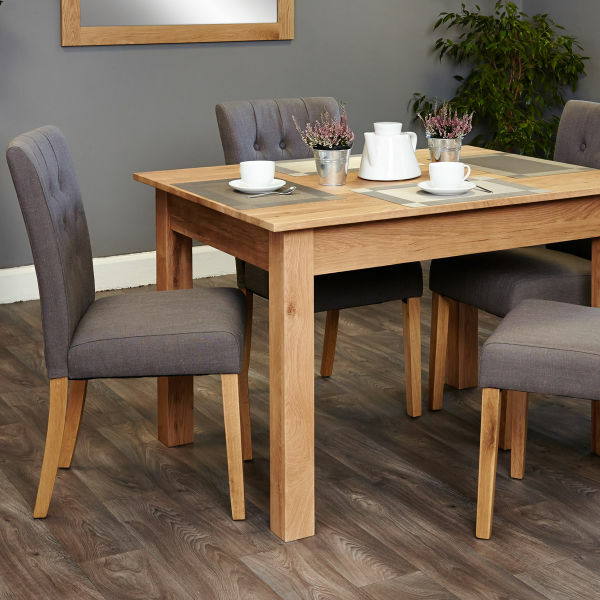 Square dining tables are the perfect shape for smaller homes where the table serves a multi-functional purpose, as they can be pushed neatly into the corner of the room. If there are just two or four people in your household, a square table is the obvious choice. 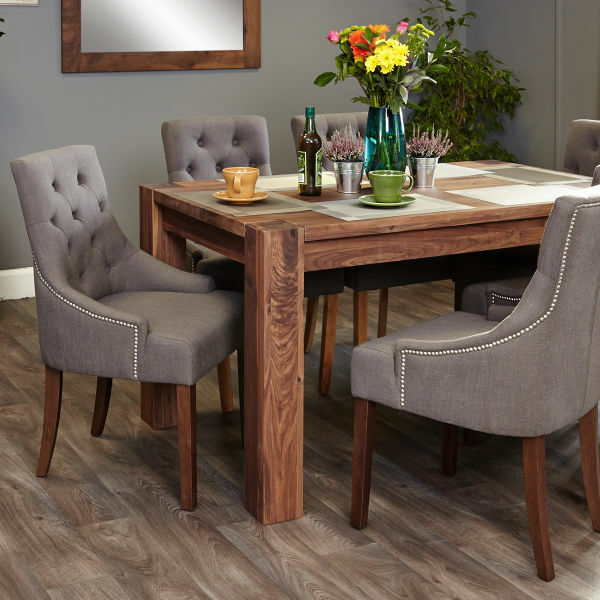 Square tables also look good in long, narrow rooms, as they offer a sense of proportion, or you can ever couple them with a rug to create a “room within a room”. 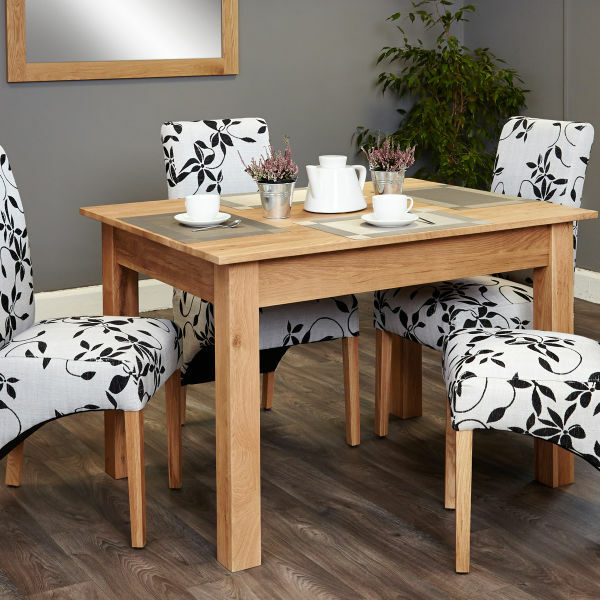 An extending dining table set is ideal if you’re a little short on space and only occasionally need to seat lots of guests. 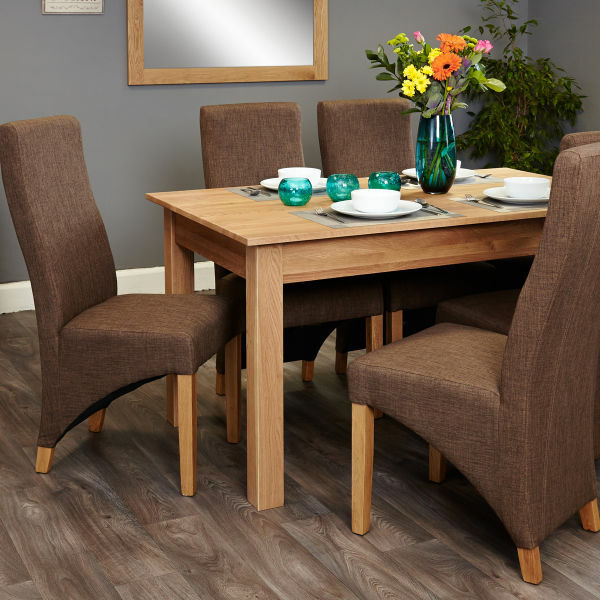 Our best selling solid Mobel Oak extending table sets have a hidden extension leaf and convert to 4 an 8 seater. 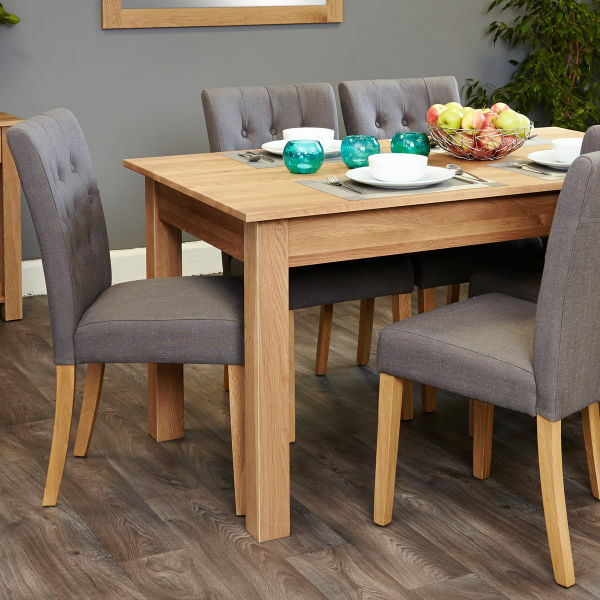 Made from solid oak, the table has a beautiful clear lacquer to highlight the wood grain and protect the dining table set for years to come. Before you order, measure carefully to make sure your furniture will fit into your room and can easily fit into your home. 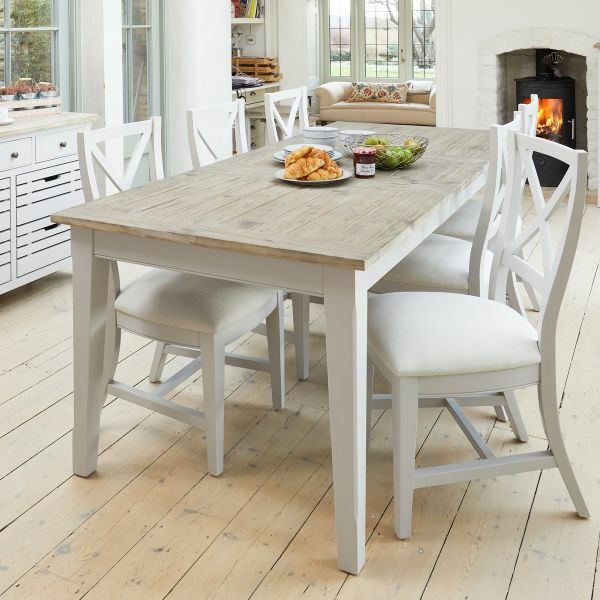 Many of our tables come apart for delivery and are easily assembled in your dining space. 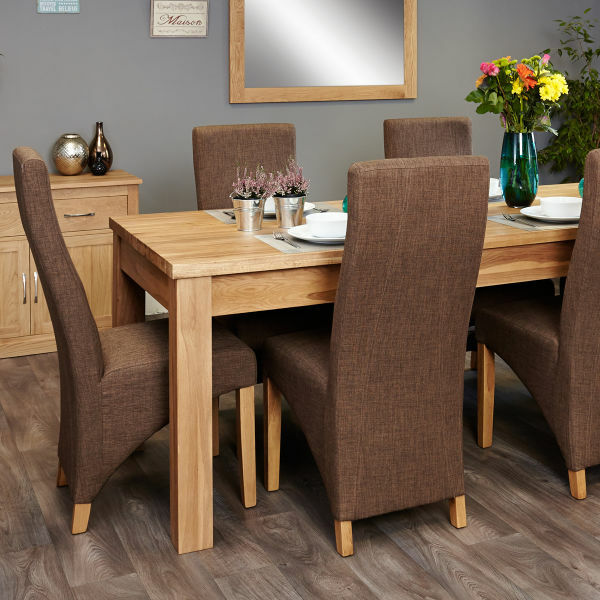 Which style dining set should I choose? 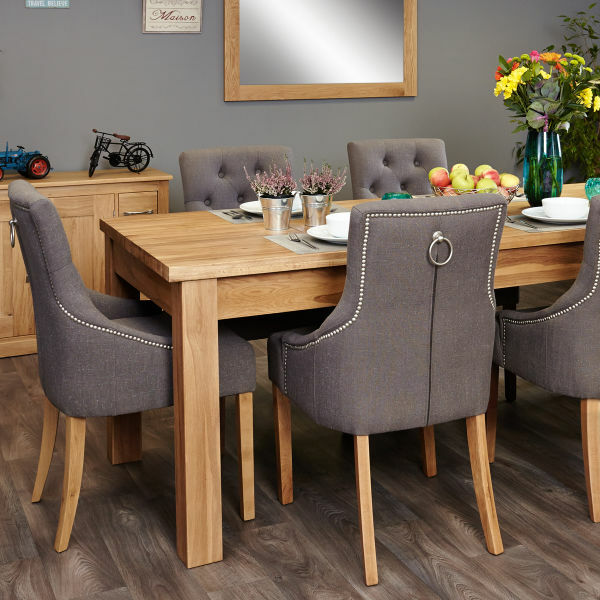 Think about design – contemporary furniture is great for a sleek and minimal look, while traditional and more country styles, are often more timeless and classic. 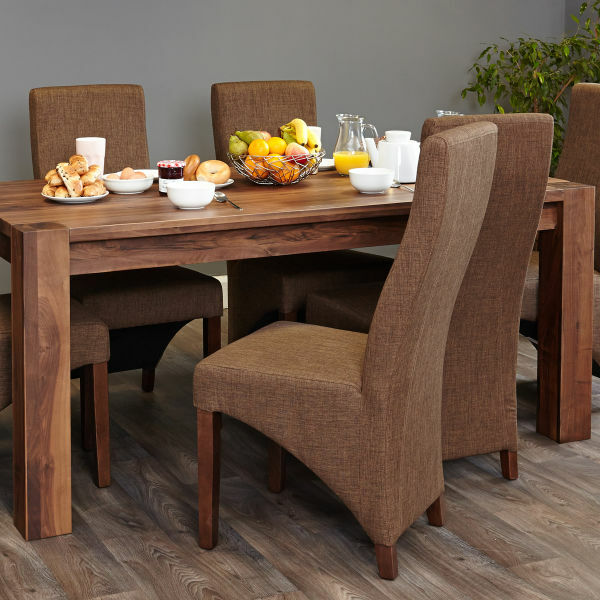 If you’re choosing the only eating table in your home, why not choose something versatile that won’t feel out of place for family breakfasts or formal dinner parties. 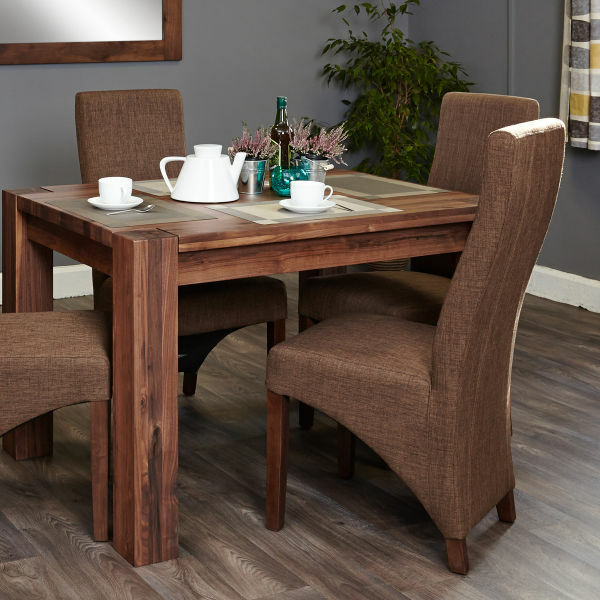 If you’re looking for a more formal dining set then you can afford to make more of a statement. 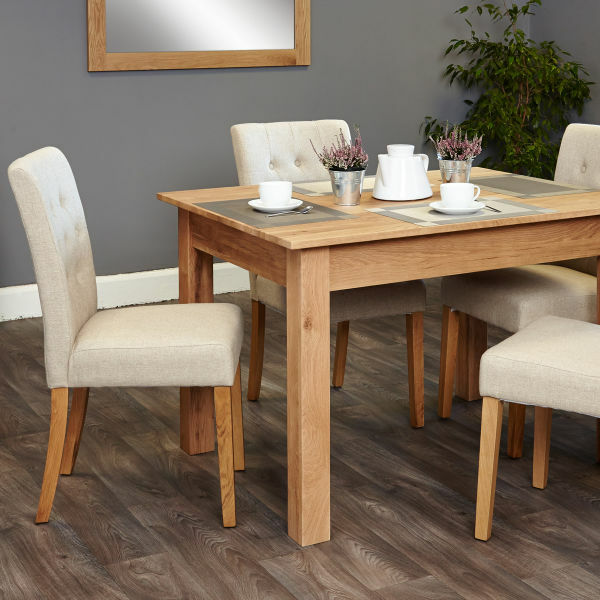 Available in solid oak, many of our wooden dining tables and chair sets tend to have a more rustic look and will age well over time. Each piece of solid wooden furniture is unique, with different characteristics in colour and grain pattern. 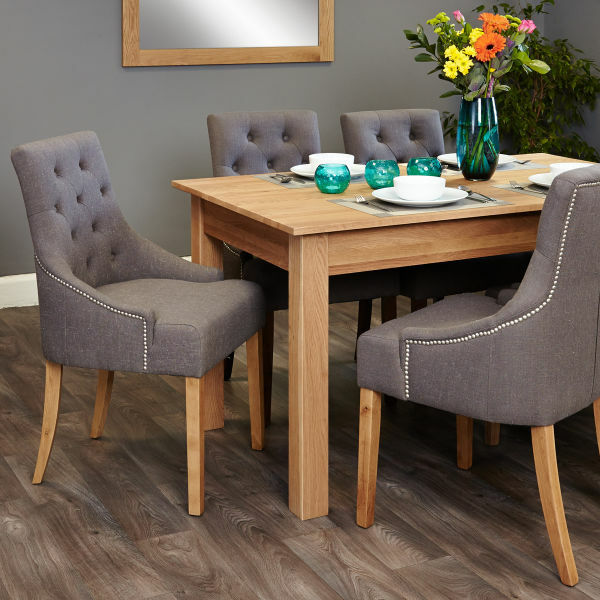 As it’s a light wood, oak works well in more compact rooms and can increase the feeling of light and space. 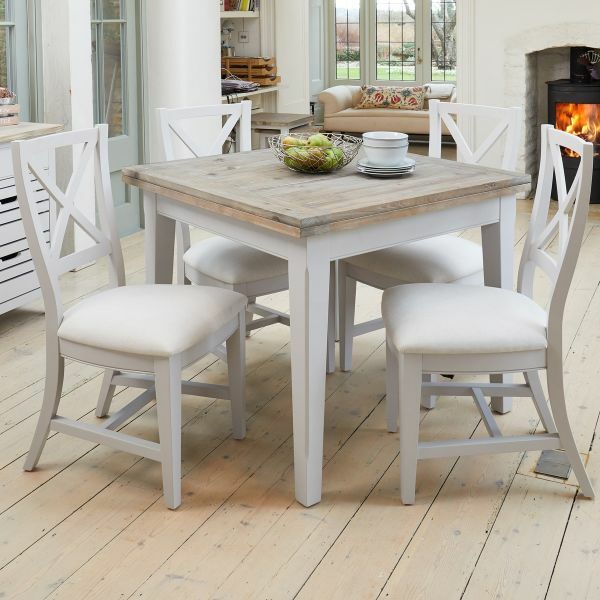 Consider a grey painted dining table and chair set from our Signature range for a more country style feel. 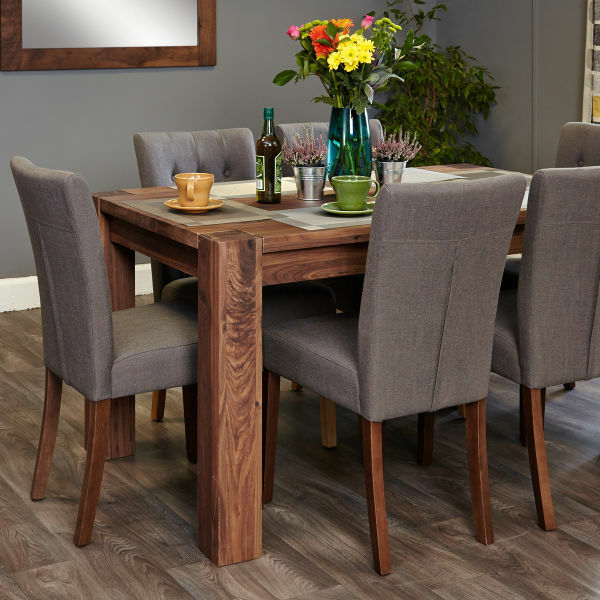 If you opt for one of our walnut wood dining table sets, these tend to work best in larger dining spaces and can have a more contemporary feel. 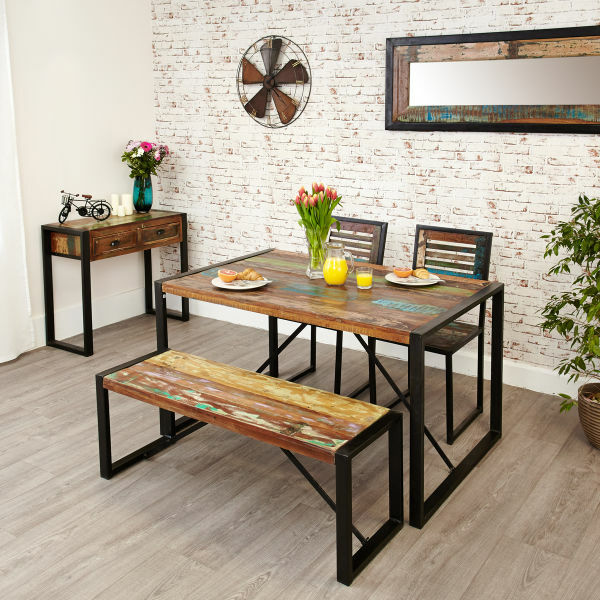 There are also modern designs with the industrial style of our Urban Chic and Coastal Chic dining sets which are made from reclaimed timber. Metal frames add a distinctive vintage feel and as they are crafted from recycled wood, each one is unique. 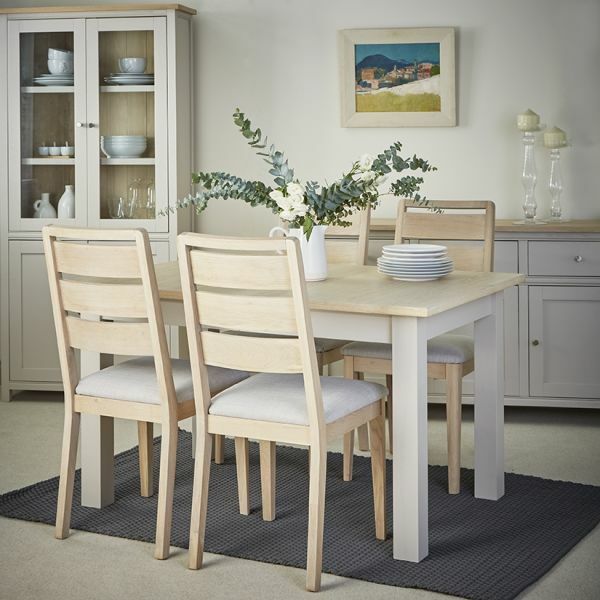 Should I choose chairs or benches in the dining set? Like entertaining? 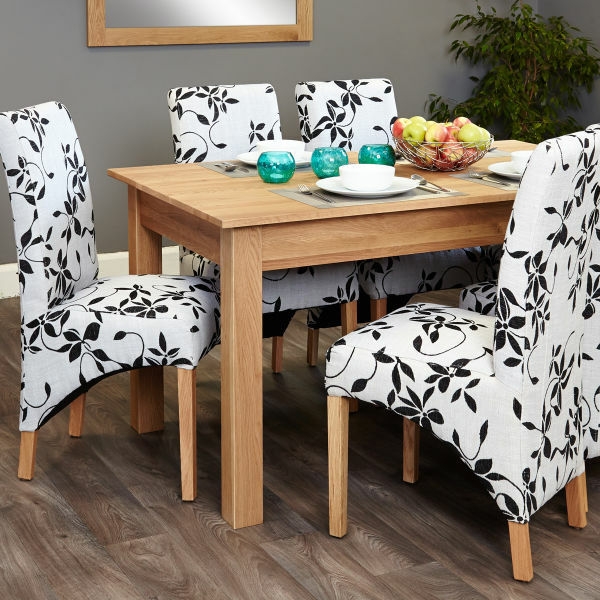 Then make your guests feel relaxed and comfortable by including top-notch upholstery in your dining set. Choose one of our coordinating chair designs that are comfy enough to sit on for a good few hours and covered in stain-proof fabric. 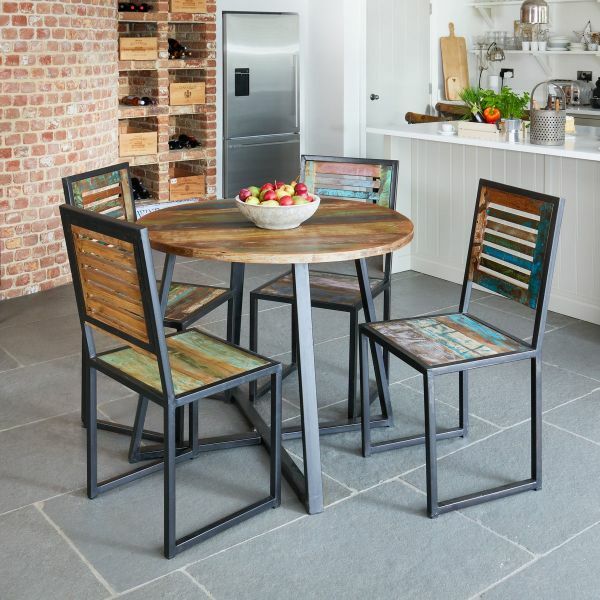 But when it comes to chairs, if you have messy ones with sticky fingers then either forgo upholstery or save it for the table ends. A bench can be a practical alternative for children as well, as they have an easier time sliding along their lengths and they’re less likely to lean back in or tip them. 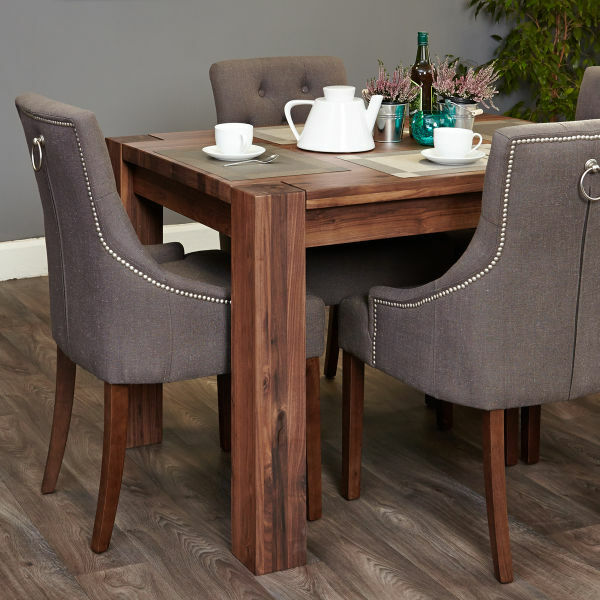 Along with affordability and style, stability and construction are important to consider when choosing a dining table and chair sets. 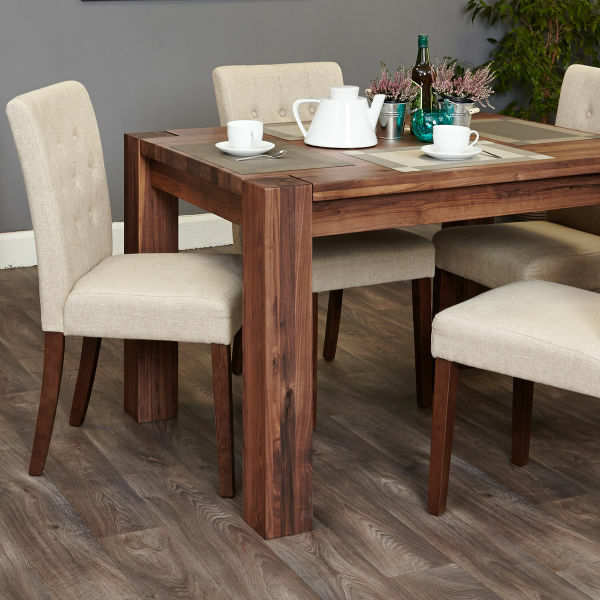 All our dining table and chair sets are made to the highest standard from solid wood and treated with a durable varnish to protect against everyday wear and tear. 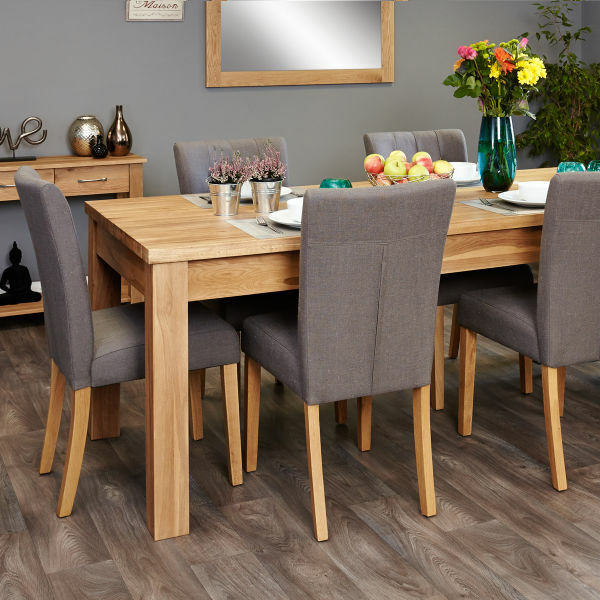 Every piece of furniture is designed to look perfect - as good as the day it was purchased and for years to come and all items from Baumhaus ranges come with a five year guarantee. Each order is delivered with care, direct to your door by our considerate logistics teams.